Did da Vinci do more than paint? Which paintings of da Vinci's are the most famous? Today’s Wonder of the Day was inspired by Emily. Emily Wonders, “Who is leonardo da vinci” Thanks for WONDERing with us, Emily! What comes to mind when you hear the name Leonardo? If you immediately think of a sword-wielding ninja turtle in a blue mask, then you've definitely had a fun childhood. Leonardo is indeed the name of one of the Teenage Mutant Ninja Turtles. Like the other three ninja turtles, Leonardo is actually named after a real Italian Renaissance artist. Who are we talking about? Leonardo da Vinci, of course! Commonly known by simply the name Leonardo, da Vinci was born in 1452 near the town of Vinci in the Tuscany region of Italy. He lived a very humble life in his early years, receiving little formal education other than the basics of reading, writing, and mathematics. Early on, however, it was clear that Leonardo had natural artistic talent. When he was just 14, Leonardo began an apprenticeship with famous artist Andrea del Verrocchio in Florence. His education in the arts was wide-ranging, including instruction in painting, drawing, sculpture, carpentry, and metalwork. Throughout history, Leonardo has been considered one of the greatest painters of all time. His most famous work, the Mona Lisa, hangs in the Louvre Museum in Paris and is believed by many to be the most famous and valuable painting in the world. 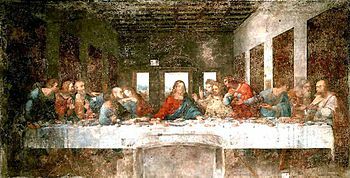 Leonardo is also well-known for painting The Last Supper, which is the most reproduced religious painting ever. His drawing called Vitruvian Man has also become a worldwide cultural icon, appearing on all sorts of items, including clothing, books, and even coins. Despite his fame as a painter, less than two dozen of his paintings have survived. He did leave behind many notebooks filled with drawings and his thoughts on painting. Today, Leonardo's lasting legacy in the art world is rivaled by only his fellow Italian Renaissance artist, Michelangelo. Leonardo is remembered today as much more than just a painter. He is considered a polymath, which is a person who is an expert in many different fields. The term is often used to describe great thinkers of the Renaissance who were experts in both science and the arts. In addition to the arts, Leonardo was considered a multitalented visionary whose interests included architecture, engineering, mathematics, hydraulics, aeronautics, physics, music, literature, writing, cartography, astronomy, geology, anatomy, zoology, and botany. He believed that science and art were intertwined such that the study of the laws of science and nature influenced his work as an artist. A true Renaissance man, Leonardo was also a military engineer and inventor. Although his ideas didn't come to fruition in his lifetime, da Vinci is famous for his sketches of machines and devices that would one day become the parachute, bicycle, helicopter, and tank. He even sketched a primitive flying machine based upon the physiology of the bat. Today, Leonardo is still considered one of the most talented people in history. The scope of his interests was incredible. Scholars believe his incredible genius was the product of boundless curiosity and unparalleled imagination. In his last years, da Vinci became the "Premier Painter and Engineer and Architect to the King" of King Francis I of France. He continued his scientific studies and produced many drawings and sketches until his death in 1519. We hope you’ll take tomorrow’s Wonder of the Day for a spin! Do you like to doodle? When you have a pencil and paper nearby, is it nearly impossible for you to resist creating some kind of drawing? If so, you have a lot in common with Leonardo da Vinci. Check out 10 Leonardo Da Vinci Projects for Kids and review the list of fun craft and Maker activities. Pick a couple to try out with friends or family! Do you enjoy a good mystery? If you do, you'll love the story of a Lost Leonardo da Vinci masterpiece 'hidden' behind Vasari painting in Florence. Jump online and click through the images to read about a painting hidden beneath a huge battle scene painted by another artist! Not everything da Vinci did was as famous as the Mona Lisa. For example, he was also an astute observer of nature. Check out his Studies of Nature online to see the many different sketches and drawings that captured his fascination with the natural world. We're sorry you don't like this WONDER, but there are thousands of others to choose from! What are some of your favorite things? How about Wonder #884: Who Was Mona Lisa? We're glad you liked this Wonder topic, Zach!! Glad you liked this one, Zedekiah! Thanks for WONDERing with us! Good one, Diana! Glad you learned more about da Vinci with us! Yes, exciting movie, but definitely fiction. Fun to Wonder about, though! Welcome back, Brody! Good to hear from you. That sounds like a pretty fun gaming experience! Seems like you can make the case that AC teaches you history? I'd give this Wonder a 7.8/10, not enough memes. I would like to know why Da Vinci became an apprentice instead of just studying in books? Good question! That was a cultural norm of the day and we are WONDERing if books might have been harder to come by back then? Plus being an apprentice meant you had a teacher to help you 1-on-1, which would be really useful. Thanks, Mia! Fantastic!😃 We are glad you are having so much fun WONDERing with us! We've got plenty more coming your way so stay with us! I didn't know Leonardo DaVinci did so much. I just thought he was a painter. Pretty amazing, huh? He had so many things he did well and was interested in. Thanks for learning more about him! I did a report on Leonardo Da Vinci and found out about some cool things he did. That's awesome! Reports are good like that - finding out new things about a topic. Glad you enjoyed learning about him, Batman! Wow! I never knew any of this information. My art teacher mentions him sometimes but I never knew about him! Thank you for this amazing WONDER. I will certainly keep WONDERing! That's awesome, Sydney! So glad you learned something new with us! That's awesome, David! So glad you learned some new things about da Vinci! That's super cool that you love to paint! What do you like to paint most? did he invent the tank as in the willie tank that was used by the british in world war 2? That's a good question, Dylan! We encourage you to do a little more research and see what you can find. Let us know what you come up with! Many people! Even though you knew him, did you learn anything new about him, Adam? This wonder of the day is GOOD! Glad you liked it! LDV was a very interesting guy. Thanks, Tom! So glad you enjoyed this one, Gabby! Thanks for WONDERing with us! Thanks for this fascinating Wonder of the day. So glad you enjoyed it, Kaboomz! This was a good one for sure. He did indeed. He was a pretty busy guy, huh? What,what,what? What´s going on here? The obvious answer is "WONDERing," Chrissy! Yeah. It's like his whole life was devoted to art! What is da Vinci’s most famous painting? Which of the following things did da Vinci think of long before it was ever invented? At the time of his death, da Vinci was the “Premier Painter and Engineer and Architect to the King” of which country?